Colin Thomas' award-winning play weaves together the stories of two twelve-year-olds: Sadako, the girl whose death by radiation-induced leukemia is commemorated in Hiroshima's monument of one thousand cranes; and Buddy, a Canadian boy whose life is being overtaken by his fears of nuclear war. A year after the recent nuclear disaster in Fukushima, Japan, this beautifully crafted show from Tokyo puts a human face to nuclear fallout. It also coincides with the UBC Museum of Anthropology’s exhibition ひろしま hiroshima by Ishiuchi Miyako, an installation of 48 photographs of clothing and personal items left behind by victims of the 1945 atomic bombing of Hiroshima (on view through February12). Presented by UBC Dean of Arts. Co-sponsors: The Metropolitan Tokyo Government; Consulate General of Japan in Vancouver; UBC St. John's College; UBC Museum of Anthropology; Theatre at UBC; Vancouver Save Article 9; and Tonarigumi. Performed in conjunction with the exhibition ひろしま hiroshima by Ishiuchi Miyako, at the UBC Museum of Anthropology through February 12, 2012. Image courtesy Bunkaza Theatre Company. 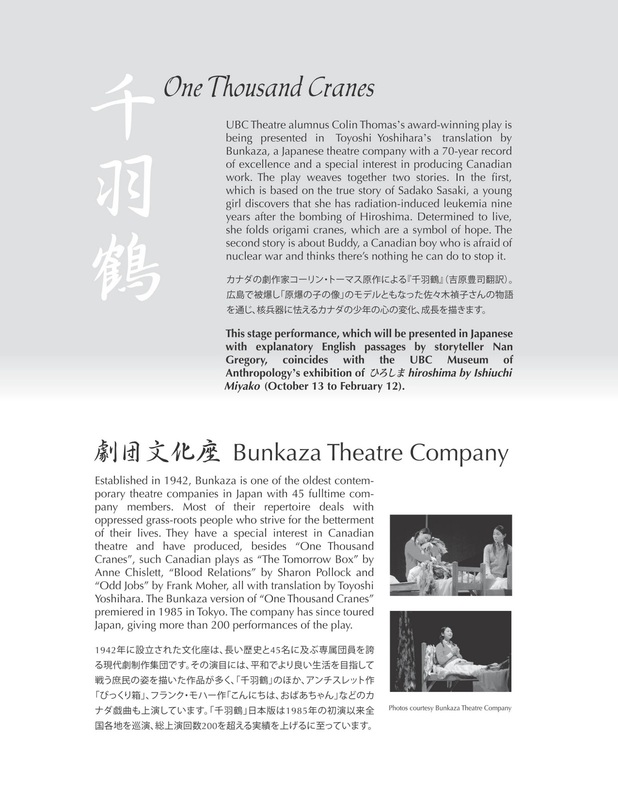 Established in 1942, Bunkaza is one of the oldest contemporary theatre companies in Japan. With 45 fulltime company members, most of their repertoire deals with oppressed grass-roots people who strive for the betterment of their lives. 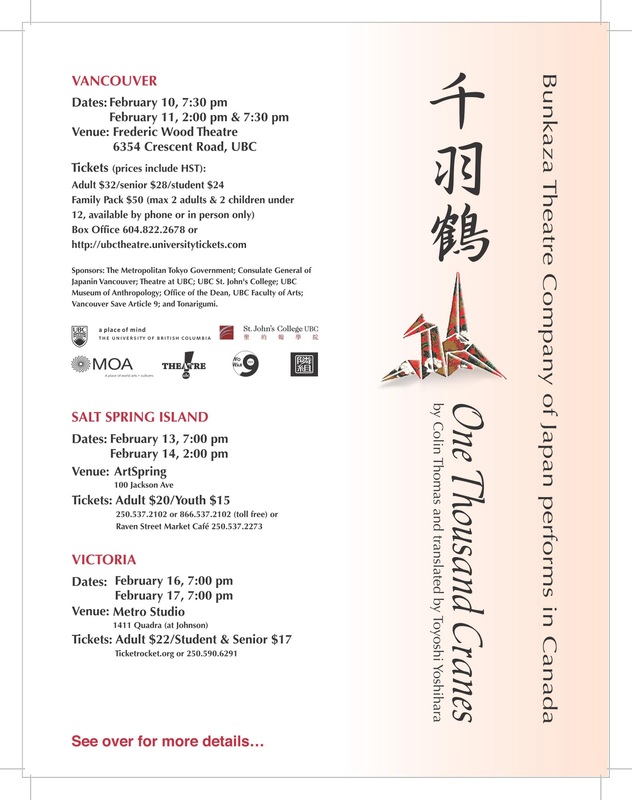 Bunkaza has a special interest in Canadian theatre and has produced, besides One Thousand Cranes, such Canadian plays as The Tomorrow Box by Anne Chislett, Blood Relations by Sharon Pollock, and Odd Jobs by Frank Moher, all with translation by Toyoshi Yoshihara. The Bunkaza version of One Thousand Cranes premiered in 1985 in Tokyo. The company has since toured Japan, giving more than 200 performances of the play.